4) Floor-mounted uprights with mounting plates. Floor fasteners not included. 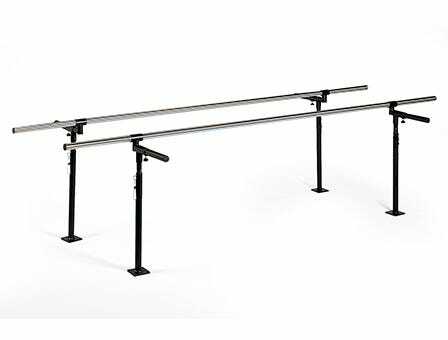 (6) uprights for bars 14ft or longer. Width adjusts from 15in to 28in wide. NEW Secure Lock System provides even more stability to our sturdy uprights. 1 ½in diameter stainless steel handrails. Heavy gauge steel base plates, uprights and fittings. Black powder coated protective finish. Each upright telescopes in 1 ½in increments and locks into (10) height positions with fail-safe ergonomic locking pin. Width adjusts with triangular control knobs on each upright.